For eighty years, the stark tragedy of Ada Blackjack, sole survivor of a failed Arctic expedition sullied by mismanagement and international politics, was incorrectly told and mostly forgotten. For eighty years, a stark tragedy went incorrectly told and mostly forgotten, until it was uncovered by Jennifer Niven. The story’s heroine, Ada Blackjack, was part of a secretive Arctic expedition. Her companions, four adventure-hungry and impressionable young men, had been beguiled by the promises of a charismatic explorer, whose own Arctic experiences were clouded by missteps and misleading characterizations. It was to this man, Vilhjalmur Stefansson, that all five entrusted their fate. The plan was a three-year polar expedition to Wrangel Island, off the northeast coast of Siberia. In 1921, the ownership of Wrangel Island was in some debate. Competing claims from Russia, the United States, and Great Britain, through its dominion Canada, led Stefansson to the idea of asserting British sovereignty via a settlement with scientific overtones. This was an attempt to restore his own reputation, which had been sullied by failures and accusations of misconduct with his previous Arctic exploits. There was also a looming possibility of Japanese penetration into Siberia, giving more urgency to Stefansson’s scheme. Wrangel Island was strategically attractive. Stefansson believed it could serve as an air base for future routes, as well as a meteorological and radio station. 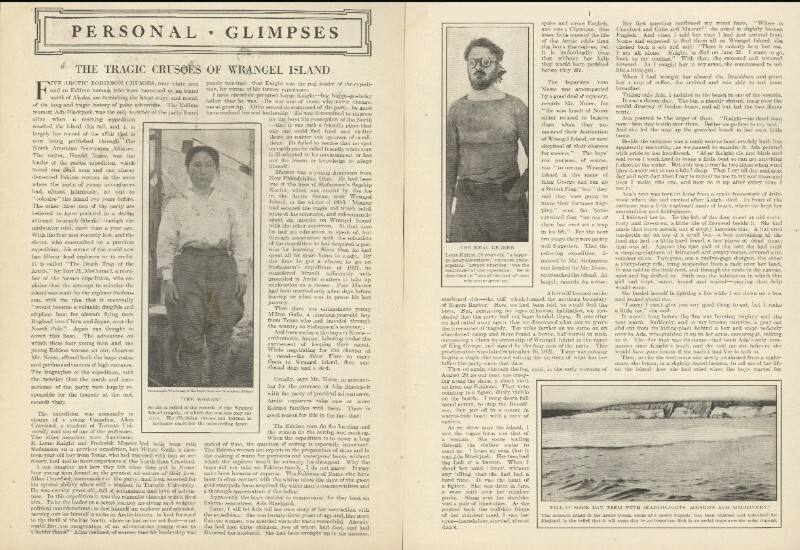 The young would-be explorers he recruited were told that the expedition’s purpose was to claim the island for the British Empire — without the support of the Canadian or British governments, for which Stefansson intended to lobby — and were sworn to secrecy. They would go to Wrangel Island, and he would stay behind, foot the bill, and get the Canadian government to accept the cause. Although Stefansson confided that there were several nations that wanted the island, he conveniently omitted any notion of danger from the Russians, whose interests were most likely affected by the political nature of the expedition. 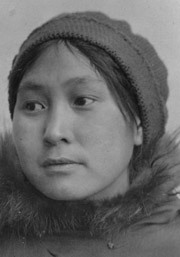 Stefansson had recommended that an Eskimo family or two be hired to travel with them — the men to hunt and the women to cook and sew protective clothing. In Nome, the adventurers attempted this, but when the day came to depart only one of the locals who had agreed to the journey actually showed up: Ada Blackjack. A widowed mother of a tubercular 8-year-old, Ada Blackjack was fearful and suspicious of the journey, but the $50 per month she had been offered meant a great deal. Upon return, she would remove her son from the orphanage where he now stayed and possibly take him to Seattle for a cure. Reluctant beause of fear and impropriety, she agreed to leave Nome with the men only after they promised that more Eskimos would be hired before they reached Wrangel Island. All that had been promised — by Stefansson to his four explorers, and they to Ada — was not to be. Instead, a ship they counted on to replenish their six months worth of supplies was prevented by extreme conditions from reaching the island, and they were marooned. Their food depleted severely with the onset of winter, and their misfortune multiplied with thinning supplies of game during the worst conditions in twenty-five years. All approaches to the island were blocked by solid ice. On Wrangel Island, life was reorganized when it became clear they would be spending another year. They moved camp closer to the wood supply and began rationing their food. Game was scarce and Ada’s worries were concerned with keeping everyone in good health. Two of the party set out for help and shortly returned, one with a case of advancing scurvy. It was decided that three would leave their sick comrade in Ada’s care, and set out for Nome over the ice via Siberia. They were never heard from again. For six months, Ada cared for her companion, Lorne Knight, as he became weaker from the effects of his disease. She cut wood, collected snow for water, set traps and taught herself to shoot. Terrified of rifle fire, she feared the polar bear even more. Knight’s decline was swift. His symptoms were horrific and the illness affected his moods. Within a couple of months he was regularly slipping in and out of delirium, and on June 23, Lorne Knight died. Controversy ensued after Ada’s rescue and continues to this day. Accusations concerning her motives and character swirled, fueled by Stefansson’s need to protect his reputation and her rescuer’s desire for notoriety. Throughout, Ada refused to speak to reporters and became reclusive in her attempts to maintain her privacy and make a new life. She did befriend Knight’s family in Oregon and returned some of his belongings to them. Stefansson attempted to settle his obligations to Ada and the men’s families by offering Wrangel Island for sale to the governments of Canada and the United States, and then to private parties. It seemed beyond his comprehension that the island did indeed belong to Russia. 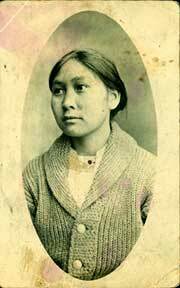 Ada Blackjack’s life continued in destitution and fragile health. Eventually, she lived alone in a shack in Anchorage, and earned a meager living at sewing, housekeeping, fishing, hunting and even berry-picking. Rumors surfaced in the Arctic and Siberia through the years about white men being sighted, but documentable information was never produced. The families of the lost men would continue to press Stefansson well into the 1930’s, but nothing was resolved. Later, Stefansson would begin to minimize and then outright deny his part in the failed expedition. Jennifer Niven has said that this book arose out of her research for a previous book, The Ice Master, a story of a doomed Wrangel Island expedition prior to Ada’s ordeal. Her research revealed the story hidden away in archives in Canada, New Hampshire, Alaska and North Carolina, within personal materials from the men’s families and Billy Blackjack’s records, recollections and files. From all of these disparate sources, she pieced together a most fascinating story of grim, heartbreaking survival. 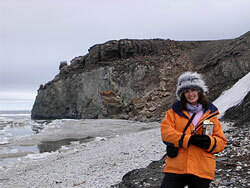 Another version of the story: Marooned in the Arctic, by Peggy Caravantes. Thank you for sharing this story. First a photo of the Dog Patch and now a common connection to Alaska. I once led a 6 week wilderness Alaska trip (for teenagers). Alaska will always have a special place in my heart.